This past November I experienced a lot of firsts when traveling to Montreal. It was my first time visiting Canada, my first time skipping a class (the extra traveling day was worth it), and my first time traveling alone. It was also my first time using Airbnb, and my first time doing whatever I wanted, whenever I wanted, in another country. Needless to say, my Montreal trip was amazing. Part of this was because Montreal itself is phenomenal. I had a fantastic Airbnb host who gave me suggestions on things to do beyond the typical locations suggested in travel guides. The weather, while cold, wasn’t too bad, and I was able to relax while exploring a beautiful city. Montreal has so many stunning and exciting things to do which means deciding what to do on a limited time schedule is difficult. Below is what I would recommend to do and see first in Montreal, to make sure none of the amazing Montreal attractions are missed. My absolute favorite part of Montreal was without a doubt Mont-Royal. 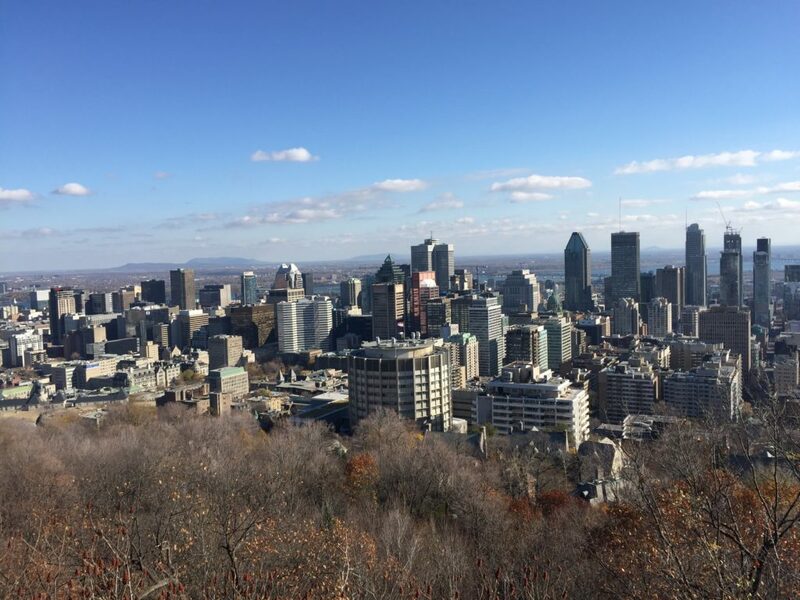 Discovered in 1535, Mont-Royal is a small mountain with multiple peaks located west of downtown Montreal. The first time I walked up the mountain it was just prior to sunset, and by the time I was at the top it was completely dark. Seeing the sky color during sunset as I was walking up the mountain was stunning. Completely surrounded by trees, the pinks and purples of the sky were breathtaking. If I had the opportunity to visit Montreal again I would definitely try to get to the top to see the sun set over the city skyline, which I imagine being even more beautiful. The view from the top is stunning. At night the city sparkles, and it made me even more excited to explore the city below the following day. 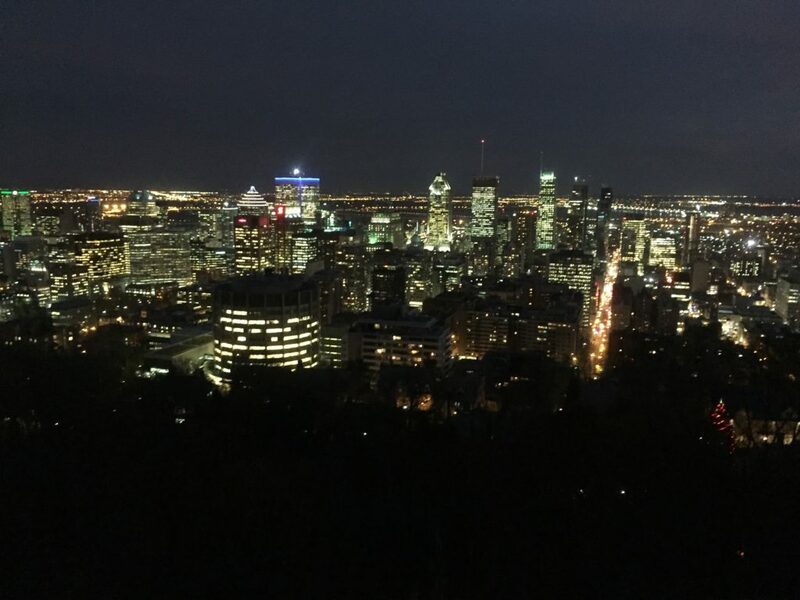 I loved the hike up Mont-Royal so much I made sure to go back and do it again during the day. I visited during mid-November so the leaves were changing colors and beginning to fall, making my hike that much more colorful and beautiful. During the day the lookout was much more crowded than it had been during the evening, but it was great getting to see the city both during both the day and night. Another selling point of Mont-Royal is a bagel shop, Fairmount Bagel, near the base of the mountain. New York is known for having the best bagels in the world, but Montreal has equal pride in theirs. Every day of my visit I stopped at Fairmount to pick up bagels for breakfast, and not a single day was I disappointed. I infrequently go to concerts. On top of that, I’m not the most knowledgeable about music, let alone bands and artists I would enjoy seeing that also wouldn’t break the bank to go out and see. Montreal however is known for being an artistic city. In Old Town there are many art galleries I explored, and Montreal’s music scene is just as prominent. Festivals are very popular, and while there were none occurring during my trip, I had the opportunity to check out two concerts during my stay. The woman who I was staying with via Airbnb, Sheenah, is in a popular Canadian indie rock band, the Besnard Lakes. 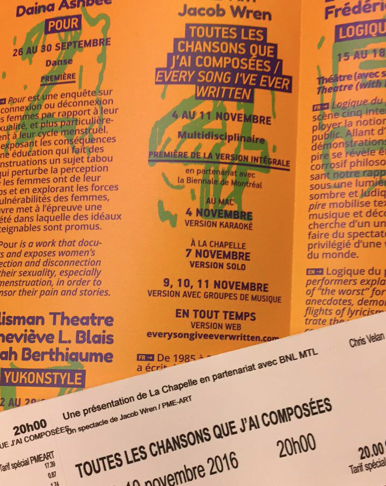 My first night in Montreal she and her band were performing with other artists in a show called ‘Toutes Les Chansons Que J’ai Composees.’ The show was great, and it was interesting hearing so many different groups interpret one songwriter’s music in their own unique ways. The following night I was able to check out another concert. One of the members of Sheenah’s band, Jace, owns his own recording studio, Breakglass Studios. He was hosting a show for Blood and Glass, a “moody punk” band, with electric harpist Sarah Pagé opening for them. The show was completely different from the one the previous night. This was smaller and more intimate, but just as cool. Not being someone who frequents concerts, having two amazing experiences in one short trip was spectacular. It was so different than what I normally do, but that is part of why travel is so cool. When traveling you have the opportunity to try out new and different things, and be pleasantly surprised by how much you enjoy some of them. 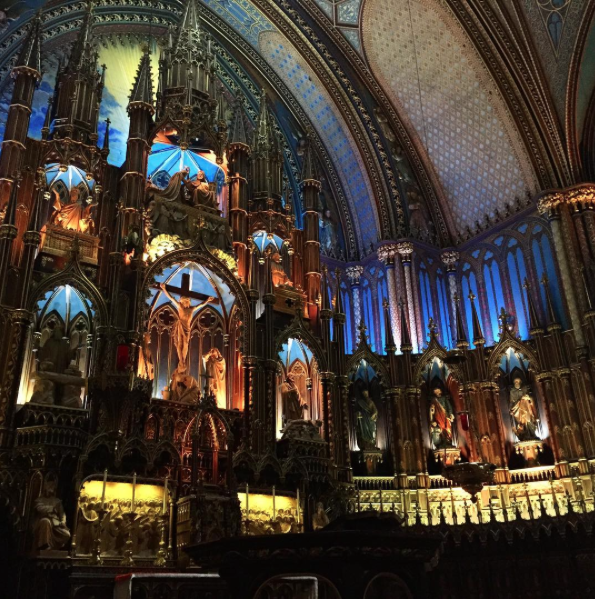 One of the most beautiful sites in Montreal is without a doubt the Notre-Dame Basilica. Dedicated in 1829, the Gothic Revival style of architecture the basilica sports is considered one of the most dramatic in the world. The basilica is absolutely breath-taking, and the stained glass is unique because instead of depicting biblical scenes, they highlight the religious history of Montreal. Without a doubt, the Notre-Dame Basilica was one of the most beautiful basilicas I’ve ever visited. The exterior was in no way representative of the interior. While the exterior was bleak, the inside was stunning. While very dark, featuring predominantly blues with some yellows and dark wood, each color was so rich it gave the entire building a warm atmosphere. The alter was also stunning. Under a domed ceiling there is a crucifix centered around what appears to be a castle, highlighting saints and other important biblical figures. While there is not traditional stained glass at the alter, above is a skylight in flower-like formations allowing sunlight to shine down. It is not just the alter that is beautiful however. Every section of the basilica is ornate, with details meticulously designed in gold, wrapping up posts and walls, all the way up to the ceiling that gives off the appearance of the night sky. There is also a magnificent looking organ, which I regret not hearing during my time in Montreal. I love markets. I’m generally new to cooking, but there is something about seeing so many different kinds of foods being sold, creating rainbows of colors in the form of fruits, vegetables, and more, that makes me want to buy everything and go home to see what I can create. For me food is not the most important part of traveling. Because I want to save money where I can, I took the opportunity to save money on food while in Montreal. Thanks to my Airbnb I had access to a kitchen while in Montreal, which meant instead of going out for each meal I could cook food at home. Therefore, I decided to stop by a market to pick up my food. 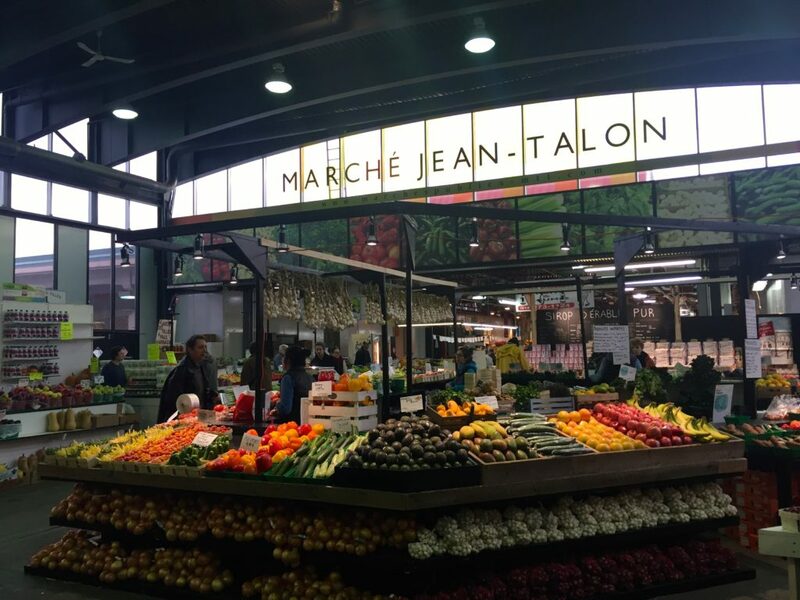 While I visited the two largest markets in Montreal, the one I most enjoyed was the Marche Jean-Talon in Montreal’s Little Italy district. While not too big to be overwhelming, Marche Jean-Talon had everything I could have asked for. There were plenty of vegetable lined stalls, an entire shop area dedicated to Italian meats, a colorful display of flowers for sale, and multiple stands selling maple syrup in a variety of forms. Part of the reason I enjoy markets is because the shopkeepers usually chat with you. Although Montreal is predominantly French speaking, I hit it off with a couple selling apples. Traveling alone meant I was quieter than normal, not having as many people to talk to. It therefore makes hitting it off with people that much better. I loved getting the chance to practice some of my French while talking with a couple excited to hear about my travels, and even happier to recommend places to visit in Montreal. While not my absolute favorite part of Montreal, an attraction worth seeing if there is time is Montreal’s Biodome. 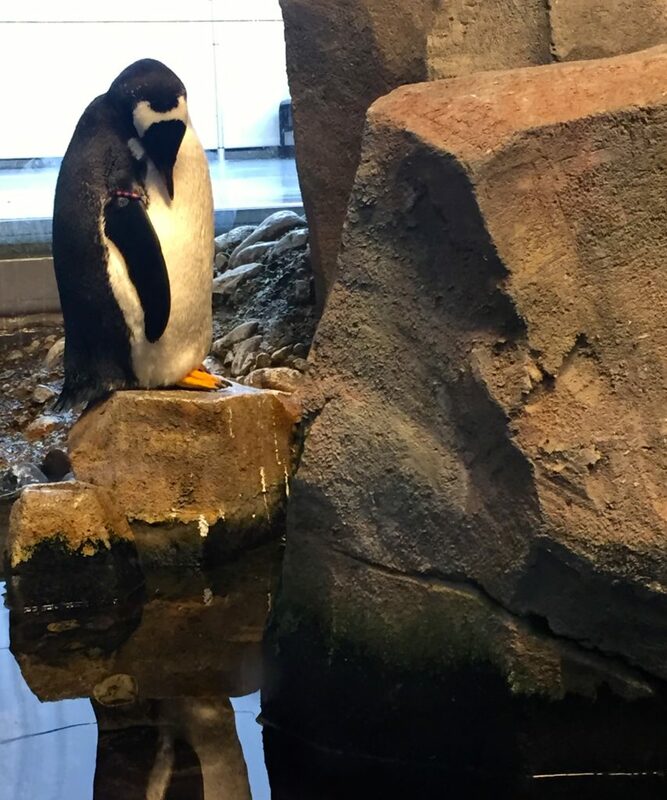 Located in Olympic Park with other attractions such as the 1976 Olympic Stadium, the Biodome is a collection of five different ecosystems. When I visited I bought a ticket for multiple attractions within Olympic Park. First was the Biodome. I’m not the world’s biggest fan of aquariums or zoos, but the experiencing of walking through different ecosystems was fun. I was continuously putting layers on and off, as each room was an entirely new ecosystem with a new temperature to match. It was particularly nice when exploring the Tropical Rainforest ecosystem, which was warm. Montreal is chilly in November, so having the chance to feel warmth was a refreshing change. The authenticity of each room was also astounding, especially the Laurentian Maple Forest ecosystem. This section felt very similar to my walk up Mont Royal the day prior, from the color of the trees to the temperature, down to the smell in the air. The only noticeable difference was that my hike was missing the adorable otters and other woodland creatures the Biodome featured. With my ticket to the Biodome I also bought access to the Insectarium and Botanical Gardens. The Insectarium was considerably smaller than the Biodome, but had a wide array of preserved butterflies and beetles pinned on the walls. In addition to this there were cases and containers of live bugs crawling amongst the building, which, as someone who is not a fan of creepy crawlies, I decided to pretend didn’t exist. What I was very excited prior to my visit was the Botanical Gardens. I had done some research online prior to my visit, and the gardens were actually the deciding factor for me to visit the Biodome, as the gardens were all but included in the ticket. The gardens are considered to be some of the most important in the world thanks to the vastness and uniqueness of the collection, composing of 190 acres of gardens. There are many specialty gardens as well, such as the Chinese Garden, the Japanese Garden, the First Nations Garden, and the Alpine Garden, with other smaller gardens supplementing these. I however, seemed to completely forget that I was visited in November. November, as I’ve previously mentioned, is rather cold. And cold temperatures do not inspire much growth in flowers. The gardens were all but entirely dead when I visited. Beds were covered, ponds were drained of water, and what was uncovered was clearly going to be replaced for the spring. While I was able to find a greenhouse that had some flowers and cacti in it, I was ultimately very disappointed. I would, however, love to come back and explore the gardens during a more seasonally appropriate time. I also learned that I need to take weather in consideration when making plans, something I hadn’t needed to consider on other trips, as I tend to typically travel during the warmer summer months. Something I unexpectedly enjoyed was visiting McGill University. 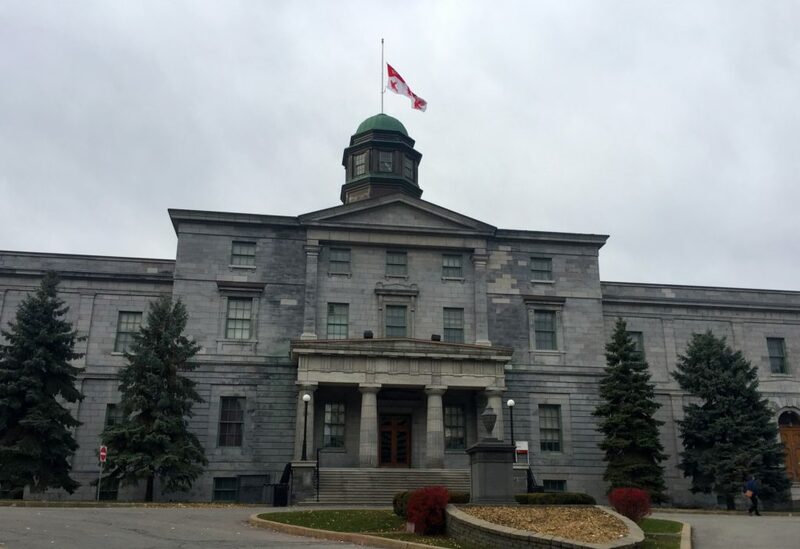 One of my friends had visited Montreal the weekend prior to my trip, and had said that if there was anything she would recommend it would be walking around McGill’s campus. Trusting her judgment, although slightly surprised that out of everything McGill was most recommended, I headed down to McGill, only to find that it shouldn’t have been surprising at all. McGill University was absolutely beautiful. Old, stone buildings make up the main campus, which was founded in 1821 as an English-speaking public research university. I felt as though I was a walking around an old medieval castle, or maybe a town straight out of a fairy tale. Needing a break after a day full of activity, I found McGill to be perfect for a peaceful afternoon. After walking around the campus for a little while, I found my way into a coffee shop where I had a magnificent hot chocolate and read a book. Completely relaxing, and just what I needed to break up a busy weekend of exploring. Montreal was absolutely amazing, and I am so happy I had the opportunity to visit. I most certainly plan on traveling to Montreal again in the future, next time hopefully for even longer! This entry was posted in North America, Travel and tagged canada, montreal, travel. Bookmark the permalink.